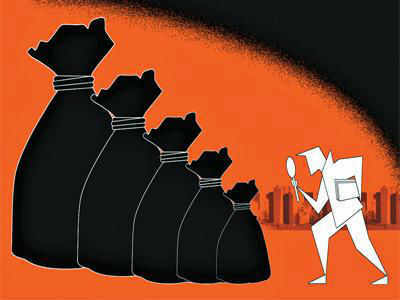 NEW DELHI: TheEnforcement Directorate has attached a dozen-odd properties worth Rs 12.50 crore belonging to the four accused and their family members in the Rs 6,000 crore Bank of Baroda hawala scam that the agency is investigating along with CBI. In a press note issued on Friday, the agency gave details of the flats and other assets which have been provisionally attached by it. The assets attached belong to four accused — Kamal Kalra, Chandan Bhatia, Sanjay Aggarwal and Gurucharan Singh Dhawan — who were earlier arrested by ED in connection with the case. Kalra was working with the foreign exchange division of HDFC bank while other accused—Bhatia, Dhawan and Aggarwal—were behind at least 15 shell companies that were found to have remitted money to Hong Kong and Dubai through the banking channels. These middlemen were involved in registration of shell companies and raising fake customs invoices to gain from duty drawback and making huge foreign exchange remittances. The anti-money laundering agency has also cracked a few other modules behind the illegal forex remittances scam. The alleged racket in the Bank of Baroda case involves at least 59 shell companies. A joint team of CBI and ED had in September searched the premises of Bank of Baroda's Ashok Vihar branch in the capital and residences of the accused. The ED had received a complaint on September 24 from Bank of Baroda about the internal inquiry being conducted by the management of the bank on the allegation of irregular foreign advance remittances to the tune of Rs 6,000 crore to Hong Kong and Dubai in lieu of proposed imports which subsequently did not take place. The accused took help of some other entry operators to create fake transactions and transfer money to foreign destinations.